This paper presents a study of acoustic interactions on simulated porosities. Models, scans on spherical targets and schlieren visualizations are used to illustrate the difficulties in assessing porosity in other than a general fashion. Examples and discussions use B-scans from pipeline girth welds but information may be used in other weld inspection practices. base metal covered with oil, grease, moisture etc. wet, unclean or damaged electrodes. With the advent of fitness-for-purpose acceptance criteria, more and more pressure is being put on NDT to not only identify and characterise flaws, but to also size them. Quan and Scott (1) noted as one of their conclusions that; "An entirely different set of problems arises when the operator is asked to make measurements. Present NDT equipment is not designed for this purpose and the operators' training is unsuitable. The requirement arises when improvements in structural reliability are sought using NDT and fracture mechanics." The effect of porosity on the weld strength is a much-debated topic, but generally it is acknowledged to be over rated and its significance poorly reflected by the stringent workmanship requirements imposed on it. Recent fitness-for-purpose acceptance criteria such as API 1104 (2) and others permit treatment of porosity as a planar defect. This too is a very conservative treatment of the flaw type but provides a handy method of allowing some sort of quantification for ultrasonic testing. Too often though, the quantification is linked to expectations that ultrasonics should provide similar results as seen by radiography, which uses comparison figures (as in API 1104 para.9.3.9) and projected areas. In 1992 the author attempted to rationalise a porosity quantification policy based on projected area (3) to "match" the radiographic criteria because no separate ultrasonic criteria was available. This was subsequently abandoned as the regulatory body permitted treatment of porosity as a planar flaw. More recently some practitioners have returned to efforts to "quantify" aspects of porosity based on both amplitude and duration of signals. Some have applied the idea to pulse-echo signals while others propose it for TOFD analysis. The following discussion will show that there is no definitive link between porosity (size, density and extent) and ultrasonic signal amplitude and "duration". In spite of its relatively poor reflecting characteristics, porosity detection is not as challenging a task for ultrasonic testing as one might think. In a recent article (4) Ginzel et al reviewed the equations made famous by Dr. Igor Ermolov. These show that pores, ideally located on the beam axis will provide very small amplitude signals. E.g. using a 12.5mm diameter probe at 5MHz, a transverse wave at 70mm in steel impinging on a 1.5mm diameter flat bottom hole (FBH) will result in a signal 21.9dB lower than the flat infinite plane at the same sound path. A 3mm diameter pore would be 33.4dB lower than the flat infinite plane, i.e. 11.5dB lower than the 1.5mm FBH. In spite of such low amplitude responses, mechanised ultrasonic systems are regularly detecting and characterising porosity. In fact, some of the pores detected are on the order of 0.5mm, and these could be off axis. Figure 2 illustrates a couple of pores detected by a mechanised scanning system. But detection is not the same as quantification. The pores in Figure 2 were detected by separate probes in a line scan. Each probe gave a different amplitude in spite of the pores having the same nominal size. When isolated as in Figure 2, pores are easily misinterpreted as linear flaws because they present no time variation in the beam and no other scatter sources are detected as would be the case for clusters of pores. But as pores begin to cluster, the wave fronts that form as a result of the scatter off them become more complex. Typically a B-scan display is used to detect and characterise porosity. By ensuring that only a small volume of weld is ensonified a reasonable sensitivity to small scatterers can be maintained. Using the pattern of the various arrival times off the pores an operator can make a reasonable assessment of the flaw type. 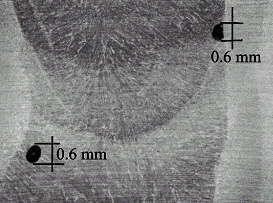 Figure 3 shows a typical B-scan over a porous volume of weld. The pattern of varying amplitudes and arrival times can be imagined to have similarities to a radiograph. Fig 3: B-scan Over a Porous Volume of Weld. The vertical scale in Figure 3 represents scan motion and the horizontal is the time along the sound path. Approximately 400mm of scan are indicated using a data collection gate of 20mm. Isolated pores in the middle of the image are separated by about 20mm but the individual pores in the cluster at the lower end are un-resolvable. As pore density increases the backscatter may also increase. But this need not always be the case. Shashidhar (5) made a series of tests on increasing densities of micropores and found no relationship between the concentrations and signal amplitudes. Variation in pore concentrations over a factor of 500% resulted in a 0.3dB maximum difference in received power. Shashindar states that, "The ultrasound echo return from a collection of contrast microbubbles is an interference pattern. 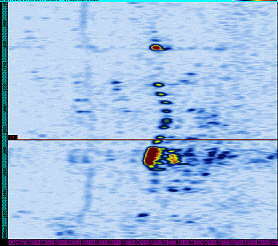 The transducer records the summation of overlapping echo returns from the individual bubbles, each return consisting of a few cycles of oscillations of acoustic pressure. The random amplitude reinforcements and cancellations which occur imply that the mean signal amplitude may not necessarily follow local increases and decreases in contrast concentration." This scatter effect can be illustrated by modeling and a simplified two body scattering example is used to illustrate the basics in a schlieren visualization. These are covered in the next section. However, scattering from point to point is not the only source of signals from a volumetric flaw. Gruber (6) and others (7) (8) (9) have explained the relationship of pore or hole diameters by the post-cursor "satellite" signals that occur after the main specular pulse See Figure 4. The undulating line around the pore in Figure 4 represents the path of a surface wave that returns by a longer route than the specular reflection. A plane wave incident on a spherical target generates a spherical wave. This can be illustrated in 2 dimensions where effectively the plane wave reacts in the single plane as it would off a cylinder. Fig 5: Reflection of the Plane Wave off a Sphere (at 2 different times). The spherical nature of the reflected (back-scattered) pulse is seen as well as the "shadow" that forms on the opposite side of the pore. Adding a second spherical reflector slightly off-set from the first allows for multiple reflections, all of which are spherical and each in turn capable of interference along the points where they interact. Figure 6 shows 3 "stops" along the soundpath. The first stop is where the pulse impinges on the nearest pore. The second stop is where the same plane wave pulse impinges on the second pore. At the third stop we see that a spherical wave is forming off the lower of the two spheres from the reflected spherical wave off the first sphere and a second spherical reflection off the upper pore forms as the first spherical wave from the lower pore move upwards to again scatter off the upper pore. Fig 7: Modelled A-scan display. 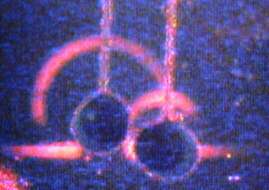 The four photos that comprise Figure 8 are taken from a laser schlieren system. Illustrated is a plane wave moving towards 2 solid cylinders (the thin vertical lines are the supports for the cylinders). 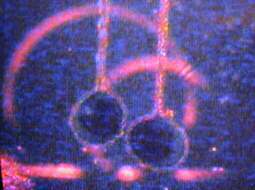 Images captured by the schlieren system show nearly identical wavefronts to those modelled in Figure 7. 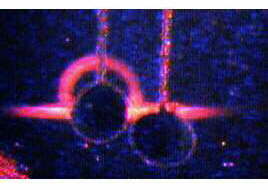 Fig 8: Schlieren Images of Scattered Waves. Note the small interference band-pattern at the point where the two arcs intersect in the lower right schlieren image. Adding a couple more pores and changing the diameters we can see how quickly the scatter can complicate the A-scan information (see Figure 9). Fig 9: Many Pores Modelled. 6 rows of pins were arranged for the experiment. 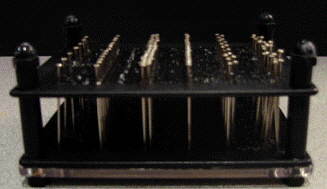 Each row was 75mm long and the number of pins in each row was varied (Row numbers are identified from left to right as seen in the photo in Figure 10). Details of pin arrangements are tabulated in Table 1. Several scans were made using an immersion set-up with 5MHz focused and unfocused probes. When using a focused probe and a fine 1mm raster it was possible to identify individual pins for all but rows Rows 3 & 4 (i.e. where no space was left between pins). A C-scan indicating maximum amplitude in the gated region shows the pattern when the scanning sensitivity is set about 8dB over an 80% response from a 1.5mm FBH. Fig 11: C-scan of 6 Rows of Pins. Figure 12 shows that the arrival times of the off-set pins reasonably represents the 2.9mm step separating the upper and lower level pin-heads. 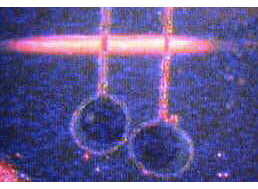 However, the ring-time duration has no bearing on the 1.1mm head depth; as well, the duration of ring is greatly dependent on the cluster position relative to the centre of the beam. This study has shown that variation in amplitude and time are not reliable indicators to quantify porosity. If the extents of porosities are considered an important parameter a method of obtaining the first arrival time from several directions of approach would be preferable to amplitude and ring-duration from a single beam direction. Typically one might identify the upper extent using a zero degree beam or TOFD and lower first arrivals could estimate the lower extent from one or two directions using angled shear waves reflected off the opposite wall. Use of amplitude and ring duration of porosity should be treated like amplitude sizing of planar flaws; i.e. a convenient policy but not a true sizing technique.